RSVP to the Spring 2019 Workshops and Webinars here. The Graduate Writing Coach has a new appointment system! Click here to learn more about how to schedule your appointments. Welcome to Graduate Writing at USC Annenberg School of Communication. 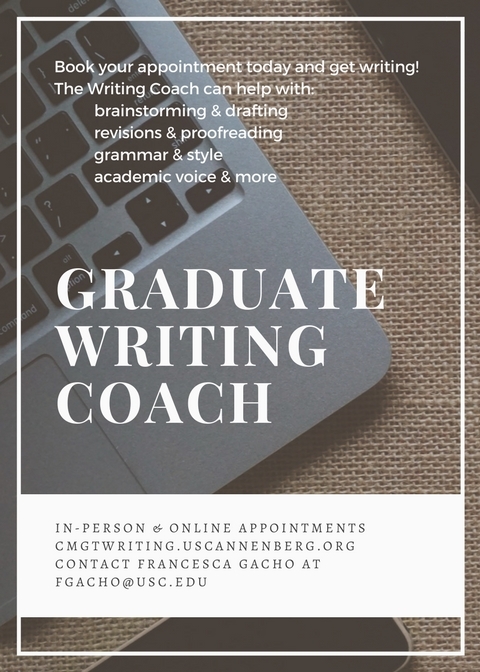 The Writing Coach works with graduate students in the following Communication programs: Communication, Communication Management, Global Communication, Public Diplomacy, Digital Social Media, and Communication Data Science. This website will have information on workshops, appointments, writing tips, and other materials. Hours may change without notice. Go to the “Book Appointment” page to see all available appointment times and to schedule your session.